Erin is excited to join the AdvisoryOne Group, work alongside her parents, and the rest of the team. Erin played D1 collegiate volleyball at University of California, Long Beach and the University of Wisconsin. Following in the steps of her Father, she graduated from the University of Wisconsin-Madison. She finished with a Bachelor's Degree in Psychology. Erin is passionate about helping others achieve their personal and financial goals, understanding that it is important to take every aspect of the client into perspective. 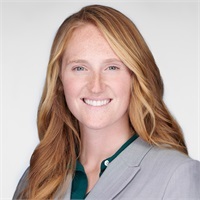 As such, Erin will be responsible for creating client websites, inputting client data, and creating financial plans as the firm's new Paraplanner. Erin currently lives in Newport Beach with her German Shepherd Cozmo.